Please join us on Wednesday, November 2nd, at the Sepulveda Garden Center, as we present “The genus Sarcochilus, its charm and ease of growth”. Carol Beule is an EMMY award winning Costume Designer with a Master of Fine Arts in both Costume and Lighting Design from the University of Wisconsin, Madison. She has been a professional Costume Designer since 1974, when she joined United Scenic Artists, a NYC based entertainment Union consisting of the creative personnel for designing film, commercials, theater productions and TV shows. Growing orchids in NYC was not considered a possibility, so she has grown orchids only since moving to Southern California in 1992. Growing outside with no greenhouse in Studio City at the edge of the San Fernando Valley is sometimes problematic. With temperatures ranging from 28 to 111 Fahrenheit, and humidity as low as 7% at times, it is always interesting. It has been her quest to find out what will and will not bloom and prosper under these circumstances. In her search to find the perfect plant for her growing area, Carol discovered the Japanese orchid called Neofinetia (Vanda) falcata and various other species that thrive outside in Southern California. Sarcochilus is one of those species. Carol grows various forms of Paphiopedilum, Phalaenopsis, Cattleya, Laelia, Dendrobium, Lycaste, Asian Cymbidium and Rossioglossum. Sarcochilus is a charming but smaller flowered species of orchids and is native to Australia. While they are often thought to be the “perfect” undergrowth plant for Standard Cymbidiums, they can be grown alongside Cattleyas and any other outdoor growing temperate climate range orchid. They can become beautiful “specimen” plants and are now starting to come in a wider range of colors due to intensive breeding by Scott Barrie and his family at Barrita Orchids in Australia. Fred Clarke, of Sunset Valley Orchids, is the US distributor for these Barrita hybrids. Carol is an AOS Probationary Judge, the 1st VP and a Member of the Orchid Society of Southern California, serves on the Board of Orchid Digest and is on the committee that creates the Society’s display for the Huntington’s annual October Orchid Show. She now is semi-retired and is starting a new business venture: “Nichi Bachi (decorative pots) by Beule” to make Neofinetia and Cymbidium presentation pots. Carol will bring some of these pots along with her for members to see examples of her work. Our guest speaker for our next San Fernando Valley Orchid Society General meeting on October 7th is our very own SFVOS member Pamela Aitchison, who will give us a presentation about the amazing world of orchid pollination. Orchid flowers are different than the flowers of most other plant species, and their reproductive methods are even more unique. 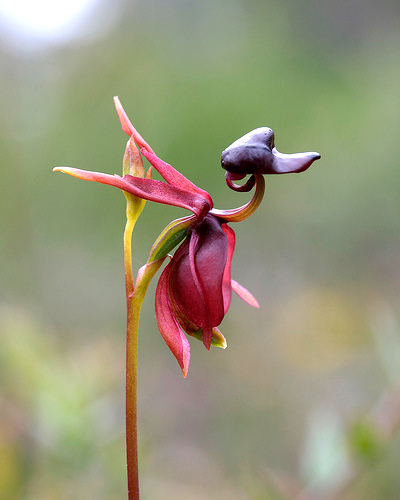 Many orchid flowers resort to clever illusions and trickery to lure their pollinators. 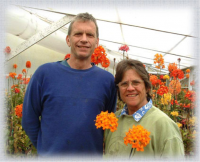 Pam is a UCCE Master Gardener, and has been teaching organic gardening for many years. She has spoken at many locations throughout Southern California including California State University Northridge (CSUN), the LA County Fair, and many schools and non-profit organizations in our region. On Wednesday, April 1st, 2015 please join us for the San Fernando Valley Orchid Society Annual Orchid Auction This year, the San Fernando Valley Orchid Society (SFVOS) is proud to offer a great selection of beautiful, rare and blooming orchids. 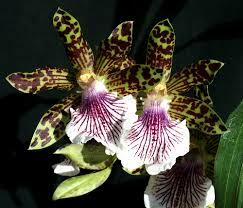 Orchid expert, Doug Overstreet, will be our auctioneer again this year.